These Enchilada Lentil Tacos have incredible depth of flavour! The lentils are cooked in a spicy enchilada sauce on the stove or in the slow cooker, then tucked inside tacos & topped with zesty lime slaw. The saucy lentils are also great for enchiladas, burritos, quesadillas or just served on rice. How have I been doing this for over two years and not created a taco recipe? 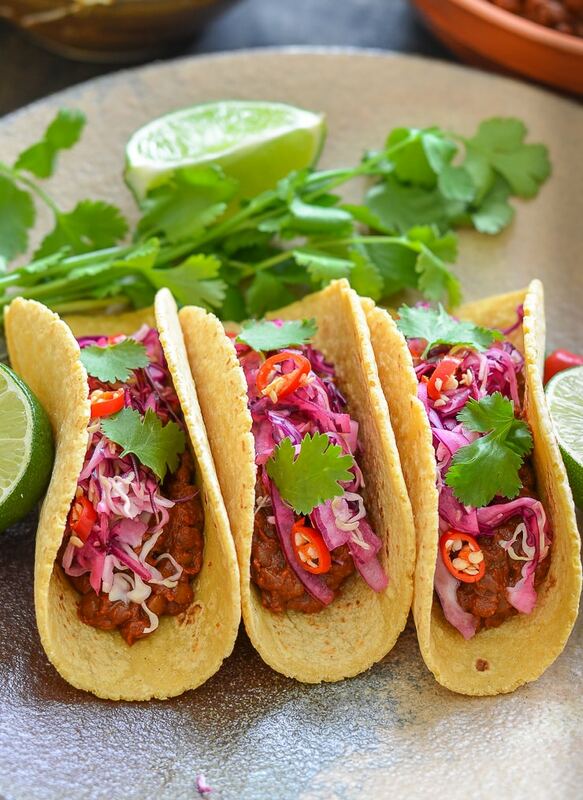 I have absolutely no idea, but I am remedying the situation now with these absolutely delicious Enchilada Lentil Tacos with Lime Slaw just in time for Cinco de Mayo! Lentils are such an underrated but wonderful ingredient. I love them in my Shepherd’s Pie and they also work really well with spicy flavours like in my Keema Lentils and now in these flavour packed Enchilada Lentil Tacos. We have all kinds of things going on in this recipe. 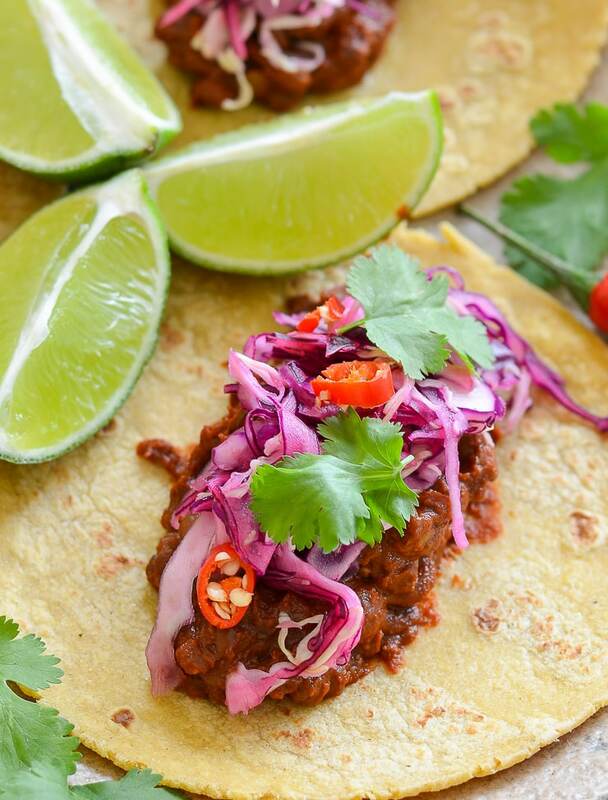 Protein packed green lentils are simmered slowly in a rich and flavourful enchilada sauce then topped with a tangy lime slaw. The slaw adds texture and a zip of citrus flavour, not to mention some pretty in pink decoration. The flavour combination is like a party in your mouth. Barely any effort is needed to make these tacos. All the sauce ingredients get blended up in a blender then mixed with the lentils and cooked slowly either on the stove or in a slow cooker. I expect they would work really well in a pressure cooker like an Instant Pot too. The slaw contains only 3 ingredients and can be prepared in a couple of minutes if you have a food processor to do the chopping, or buy a pre-chopped bag from the grocery store for even less effort and just make the dressing which is quite literally just fresh lime juice and a touch of maple syrup. It adds the perfect amount of sharp sweetness to the spicy lentil filling. As for accompaniments, the tacos are pretty filling themselves so don’t really need much but a nice crisp salad would be nice and I would highly recommend a side of guacamole. Avocado and Mexican food go hand in hand, and the cool creaminess of guacamole works so well with with these tacos. I have been using this nifty 4 in 1 Avocado Tool from Casabella when preparing my avocados. I get through such a lot of avocados, that having a dedicated tool has proven pretty useful. It sure beats my usual spoon and fork method! This 4 in 1 Avocado Tool cuts, scoops, slices and mashes your avocado with ease. The cutting edge is not sharp at all so there is no danger of accidental cutting of hands but it slices though avocado incredibly easily. I have always used a spoon to scoop my avocado from its skin but this tool removes it so much more efficiently with nothing left behind at all. Once scooped out, it can be sliced or mashed with the tool. This tool would be great for mashing other things like banana and small amounts of potato too, or even for baby food preparation. And this my friends is a Guac-Lock. A total game changer for me as it stops your guacamole from turning brown. I was sceptical but tested it this weekend. I made guacamole, put it in my Guac-Lock and left it out at room temperature for 24 hours just to give it a bit of an extra challenge. You might have seen my little Instagram story. Twenty-four hours later I checked in on it and it was still exactly the same colour as was when I made it! If you are a guac lover you will know that usually it goes brown within a very short period of time. I have previously tried all kinds of tricks with no great success. The last one I heard was that if you covered it in water in a sealed container it would stay green. Well it stayed green but was a disaster when it came to pouring the water off. Half of my precious guacamole went down the drain with it. What was left was watery and disgusting. I had all but given up and come to the conclusion that I needed to just eat the whole batch or it was wasted. Now I have a Guac-Lock my brown guac problems are no more. A scattering of fresh cilantro finishes off these Enchilada Lentil Tacos beautifully. It adds another fresh burst of contrasting flavour, and the pop of green against the dark lentils and the pink slaw is just beautiful. I love herbs of all kinds and am so excited that my little herb garden is finally coming back to life after the long miserable winter we have had. I can’t wait to be able to go cut my own as I need them instead of having to buy them. No more will I have to search for the scissors that someone has inevitably taken and lost just before I need them, because I now have my own Clip ‘n Strip Shears! 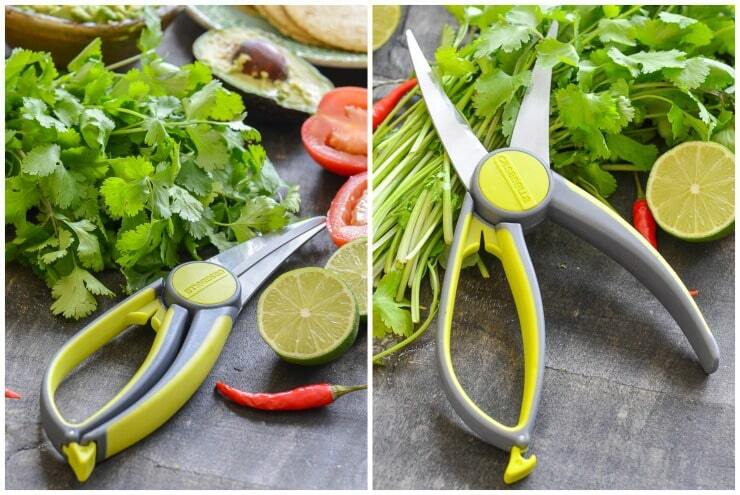 Not only do they snip through the toughest stems with ease, but they also have a handy leaf stripper built into the handle. Woah… I’ve had such fun playing with my new fancy tools and creating this Enchilada Lentil Tacos recipes. I can barely contain my excitement about doing it all again this Friday! I will be building tacos a-plenty, sprinkling them with cilantro, serving them with huge dollops of guacamole, then sitting back and enjoying the flavour p-a-r-t-y in my mouth. Absolutely mandatory (to wash it all down), is a large margarita. It’s Cinco de Mayo…Push the boat out…… ???? I’m not much of a cocktail maker but when I do make one it needs to be ‘da bomb. This Mint Cucumber & Smoky Jalapeño Margarita from the lovely Kristy at She Eats fits the bill perfectly. Roll on Cinco de Mayo. We all need some tequila taco time in our lives! If you give this recipe a try be a ☆ and let me know what you think in the comments below. I would love to see your Cinco de Mayo party pics but please make sure it’s before you’ve had one too many tequilas! ???? Add all of the Enchilada Lentil ingredients (except the lentils and the salt) to a blender and blend until smooth. Pour into your slow cooker, add the lentils, stir and turn your slow cooker on high for around 4 hours or low for 6-7 hours. Add the salt once the lentils have cooked and stir well. Add all of the Enchilada Lentil ingredients (except the lentils and the salt) to a blender and blend until smooth. Add to a pan, pour in the lentils, stir and bring to a simmer. Turn down to low and cook for around 2 hours, stirring occasionally. Shred the cabbage and onion finely. I used my food processor. Mix the lime juice with the maple syrup. Keep them separate until just before serving then coat the cabbage and onion in the lime mixture. 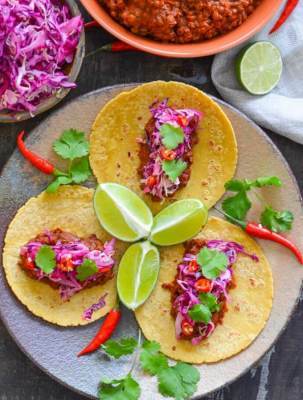 Fill tacos with some of the lentil filling, pile some slaw on top & garnish with cilantro. 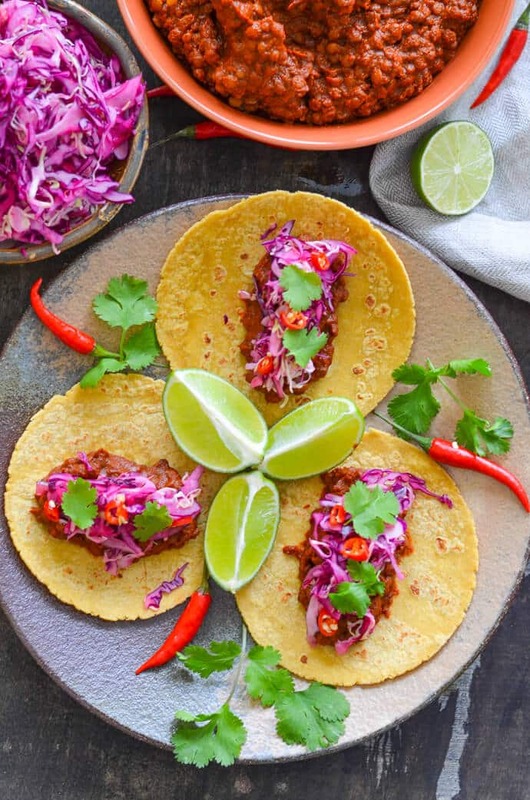 The filling and slaw are both totally oil-free but most store bought taco shells or tortillas do have oil in them. For a healthier, completely oil-free version, try using crispy lettuce leaves instead. Nutritional information is calculated using Old El Paso 6" soft tortillas. Thank you to our friends at Casabella for sponsoring this post! Hi! I made this with the slow cooker recipe and used French green lentils and it was delicious but took forever to cook. I would like to use the instant pot but was not sure about any changes I might need to make on the amount of liquid and the appropriate time to put it on. Would appreciate any suggestions. Thank you! I couldn’t go back to a slow cooker after using my Instant Pot! Ha ha. It’s so convenient. 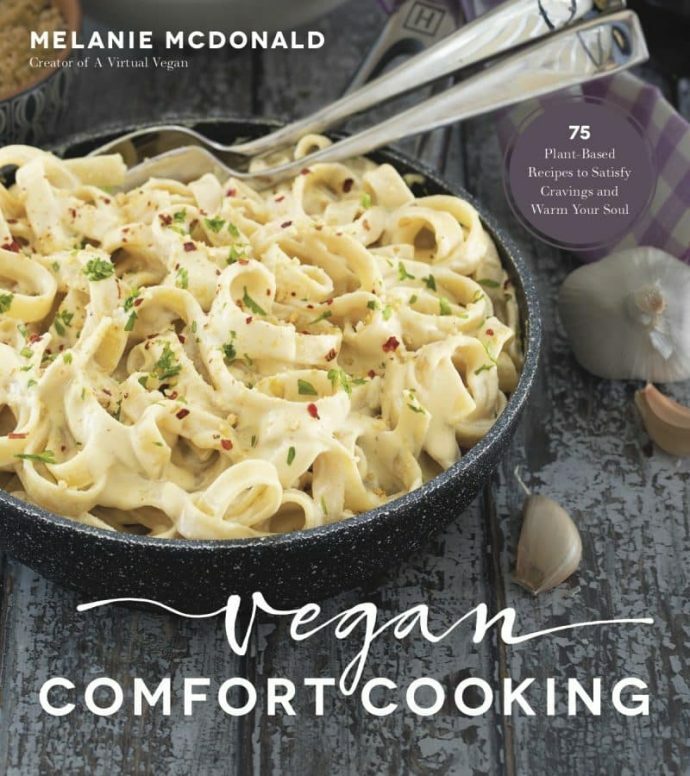 I have not tried this recipe in my Instant Pot though. My worry would be, that it needs to remain pretty thick so you can use it as a taco filling without it running out all over the place, and if you don’t add enough liquid to the IP you end up getting the burn message and it doesn’t cook properly. You could make it with more liquid and use it for another purpose instead of tacos though. It would be nice served over rice or quinoa, or in a burrito bowl kind of meal. I think you would need to use at least 2 cups of water, maybe 3? It’s so hard to say without trying it. For the time, I have an Instant Pot Dal recipe using red lentils and that takes 8 minutes. I think as these are green lentils and they take a bit more cooking, maybe 15 minutes high pressure with a natural pressure release? Let me know how it goes if you try it. I’d be interested to know! These are deliciously spicy and very easy to make. The lime slaw is tasty. I served with guacamole as well. The 4 hours on high is perfect. The only change I made was to reduce the chili powder to 1/4 cup and I only had 1 tablespoon of smoked paprika. This recipe used large amounts of spices but the flavor is perfect. A friend invited me over for dinner and was unsure of what to fix since I am vegan. She found this recipe on your website and followed it precisely. These are fantastic. The flavors burst in your mouth with every bite. I ask for the recipe and after following the link for it to your website, I now subscribe. Your recipes that I have reviewed just in the past few hours appear scrumptious. I am looking forward to your newsletter. Thank you so much. I’m thrilled you enjoyed them so much, and what a lovely friend you have! A keeper for sure. Thanks for subscribing to my newsletter. 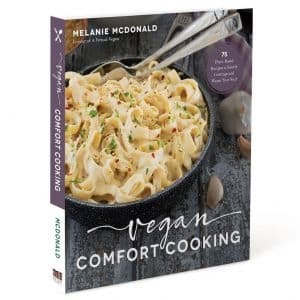 Just so you know, things are pretty quiet on my website and the newsletter right now because I am in the midst of writing my first cookbook. I hand in the manuscript at the end of September and then normal service will be resumed here. I just thought I should mention it in case you think my newsletters aren’t getting to you! The lentils will be ok for 4 – 5 days in the fridge. They freeze well too. The slaw is probably only good for 2-3 days max though but it’s really quick and easy to make so you could probably get away with making a little bit of it up fresh when you need it. You could chop the cabbage ready and keep it in a container in the fridge to speed thing up. Hope that helps! The recipe for the slaw mentions to shred the cabbage and onion, but onion is not listed as an ingredient. Is that a typo? How much and what type of onion? I’m really sorry! I just amended it. It should have said ½ a red onion, sliced finely. OK., I definitely need a Guac Lock! I go through a TON of avocados and have tried many tricks., none of which work perfectly. Great invention! It is a great invention. It’s so nice to be able to make my guacamole in advance and know it will still look and taste fresh! I love the idea of combining enchiladas and tacos! So clever! Thank you Dianne. It works so well! Wow these look incredible!! Will be trying them this weekend thank you! 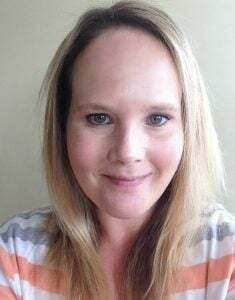 Love your blog ???? Thank you so much Anna. I hope you enjoy them! Enchilada LENTILS!?! Talk about creativity! And when you threw in tacos, I was sold! Thank you Casey! They are THE tastiest lentils ever! Ok you need to come up with more taco recipes Melanie! These tacos sound wonderful! Lentils and enchilada sauce…they seem packed with flavor! Thank you Anjali. I do don’t I? I have no idea why I waited so long! 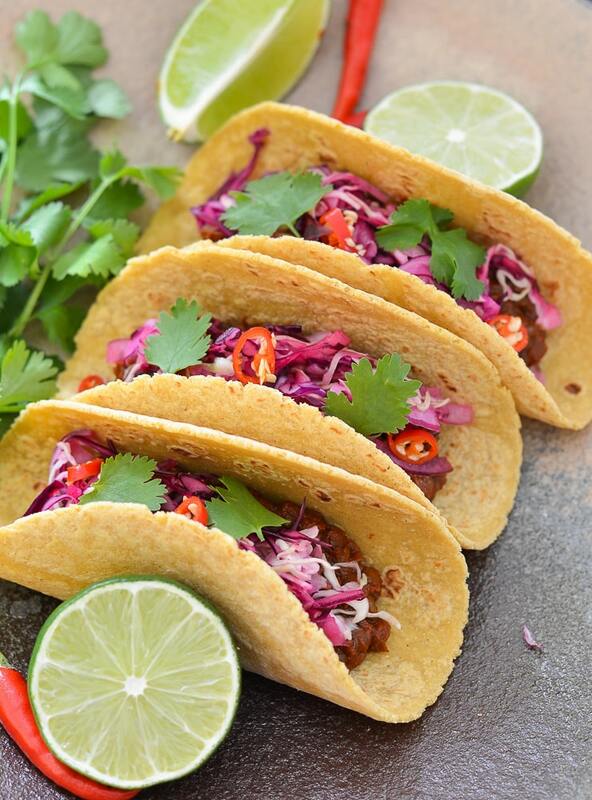 You know I love tacos, so I’m excited to see a taco recipe on your site! Those Cassabella products look really cool. Yes I do and thank you. They are really cool products. 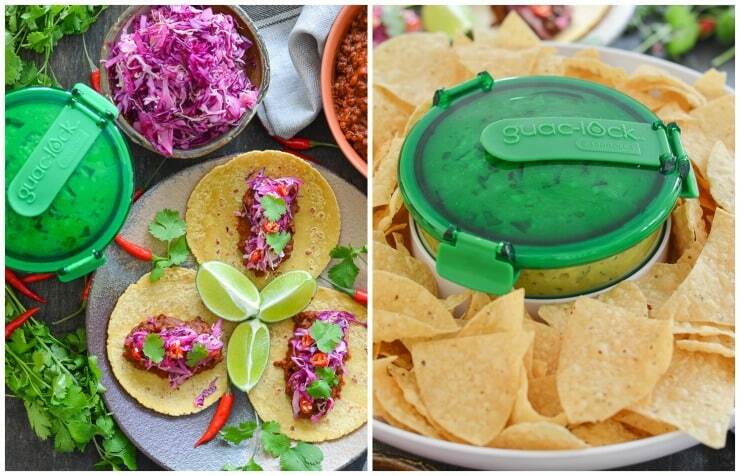 I am loving the Guac Lock especially!